Looking for a New Volkswagen Tiguan in your area? 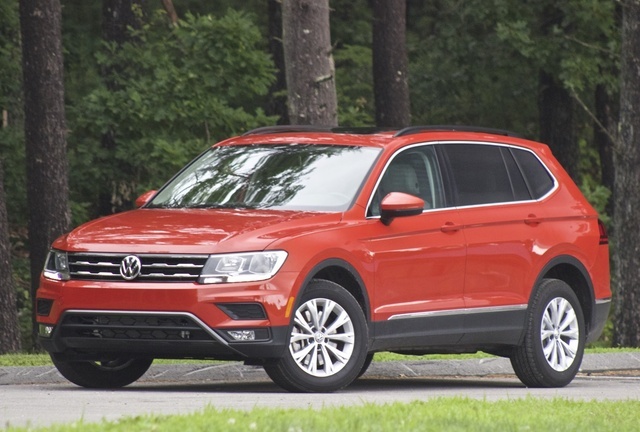 CarGurus has 671 nationwide Volkswagen Tiguan dealers with 72,033 new car listings. The 2018 Volkswagen Tiguan pivots mainstream, adding 58 percent more cargo space. But it also loses some of what once made it unique among compact SUVs. If you follow the latest car news or are even casually into cars, you've probably heard about how the crossover market is taking over the industry. But it doesn’t truly sink in until you count them all out and realize that there are at least 17 vehicles that technically compete in the compact SUV segment. Volkswagen has recognized this, and rather than continuing to offer a single niche vehicle, it decided to address the top needs of the modern crossover buyer. That means a focus on cargo space, backseat room, the option of a third row, and the latest in-car and safety technology. In the process, the Tiguan has also lost some of the focus on driving excitement that once made Volkswagens special cars. The first-generation Tiguan was a far different beast from the 2018 model. It entered the market for the 2009 model year, delivering solid performance and an upscale cabin. On the other hand, it was tight on cargo space and lacked some crucial safety tech. VW has met these criticisms head-on with the ’18 Tiguan, but learned the hard way that you can’t offer the versatility of a scaled-down minivan and do fun-to-drive at the same time. 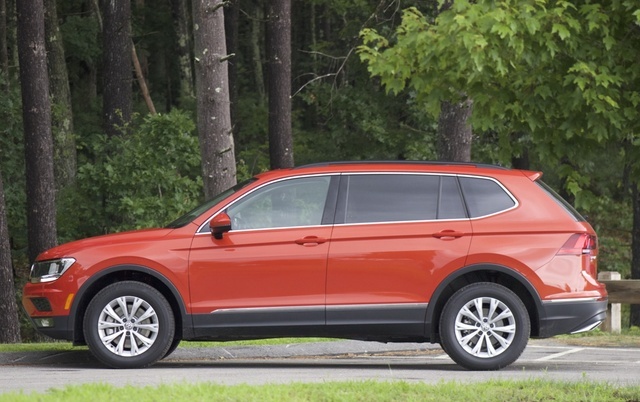 The 2018 Tiguan stretches out 10 inches longer than the first-generation model. This added length is most obviously manifested in the rear doors, which are even longer than the front doors. In Europe, Volkswagen offers two wheelbase lengths for the Tiguan, much like a luxury sedan or a Range Rover. But clearly in the States, our corn-fed hides get the longer Tiguan. This increased length not only provides an incredibly spacious second row, but also lets Volkswagen offer a third row in the Tiguan. Until now, the Nissan Rogue was the most notable rival to offer a third row. The Land Rover Discovery Sport also offers a third row, but clocks in at a much higher price point. For 2018, VW offers it standard on front-wheel-drive (FWD) Tiguans and as an option on all-wheel-drive (AWD) versions. Squint and you can see where the Tiguan’s added length gives it the impression of a smaller, lifted minivan. And that’s really what most compact crossovers are. 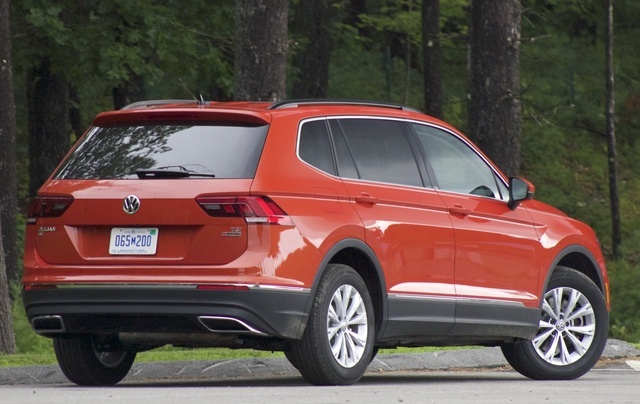 To liven up the look of the Tiguan, Volkswagen offers Habanero Orange as a color option. However, we suspect most buyers will go for the typical white, grey, or silver. The fact of the matter is that some will find the straight lines of the Tiguan refined and upscale. Most automakers are going for bigger and bolder, and so to many buyers, the Tiguan’s styling might be too sedate. Step into the driver’s seat, and you’ll see Volkswagen’s strongest attribute: an interior layout that's upscale without being overly complicated. The first-generation Tiguan had an interior aesthetic with an emphasis on curves and circles. In the time between generations, Volkswagen moved back to the squared-off look of its popular cars from the 1980s and '90s. Volkswagen takes that a step further by going trapezoidal with many of the Tiguan's cabin elements, including the vents and infotainment bezel. Trims for the Tiguan are S, SE, SEL, and SEL Premium. The base S comes standard with LED taillights, integrated roof rails, power/heated side mirrors, automatic headlights, trailer hitch preparation, and a 6-speaker stereo featuring a 6.5-inch touchscreen and Bluetooth connectivity. Move up to the SE, like our test model, and you’ll get keyless access with push-button start, dual-zone Climatronic climate control, a leather multi-function steering wheel, power driver’s seat, heated front seats, leatherette upholstery, a multifunction steering wheel, and an 8-inch touchscreen infotainment system with voice control. The SEL adds remote start, a third USB port, navigation system, panoramic sunroof, adaptive cruise control, and one-touch power liftgate. The range-topping SEL Premium features everything from the SEL plus ambient lighting, power-folding side mirrors, rain-sensing wipers, a heated steering wheel, leather seating, and a hands-free power liftgate. The SEL Premium also comes with a 9-speaker Fender premium audio system. Options and packages on the Tiguan include third-row seating (on 4Motion versions only, as it's included on FWD models), the panoramic sunroof with ambient rail lighting, and the Driver Assistance Package. Later this year, Volkswagen will offer the R-Line Package, bringing an upgraded performance look to the Tiguan. The only engine for the Tiguan is a 2.0-liter turbocharged 4-cylinder that makes 184 horsepower and 221 pound-feet of torque. Power gets sent though a new 8-speed automatic transmission to the front wheels or 4Motion AWD. 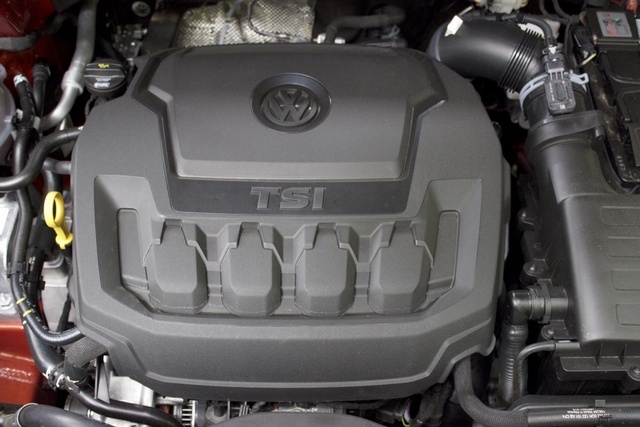 In past years, Volkswagen offered the Tiguan with a TDI diesel engine, but in light of “Dieselgate,” we get only the gas engine. There’s no news on the future of the TDI being offered in the States, either. Tiguans with 4Motion offer a system called Active Control. It features drive-mode settings for On-Road, Snow, Off-Road, and Custom Off-Road. You cycle through these modes using a dial down by the shifter. Press the button in the center of the dial to select the On-Road mode. A menu pops up that allows you to switch between Normal, Sport, Eco, and Custom drive modes. If you are in Drive, you can pull back gently on the shifter to engage Sport mode for the drivetrain. Frankly, engaging Sport Mode is the only way to get anywhere in a hurry. In most settings, the Tiguan has sluggish acceleration. Sport attempts to bring this crossover to life, but just barely. The first-generation Tiguan at least had athletic handling. The new 2018 model feels more like a minivan than a crossover. The handling dynamics are not terrible. You just have to remember that Volkswagen is the brand that brought us the GTI, GLI, and Golf R. If you have a memory of past Volkswagens, the Tiguan will feel disappointingly like your average commuter car. For EPA fuel-economy estimates, the FWD Tiguan gets 22 mpg city, 27 highway, 24 combined. Opt for the Tiguan 4Motion, and those numbers drop to 21 city, 27 highway, and 23 combined. We failed to hit even those numbers, observing fuel economy of just 19.3 mpg combined. Mind you, we used Sport mode most of the time. The crisp lines are only part of the Volkswagen charm in the cabin. Controls for the Tiguan are straightforward, without ever being too basic or feeling too cheap. The three-dial climate-control setup is a welcome departure from complicated setups offered by modern rivals. All around the cabin, you’ll find places for gear, wallets, bags, and more. The cargo trays in the doors are massive and can easily hold three water bottles. The center stack has a cubby for your phone and also contains a pair of USB ports. Like most cars, the Tiguan has a center compartment between the seats. It's adequately sized for wallets and charging cables, but too small for any type of purse or bag. Perhaps the greatest addition to the new Tiguan is the second-row legroom. It’s quite spacious, and even taller occupants will have plenty of room without requiring the front passenger to move up at all. With this in mind, the Tiguan would make a great car for Uber or Lyft drivers. This is especially true when you consider the FWD model comes with (and 4Motion models are available with) a folding third-row seat. You’ll have to make the choice between 7-passenger seating and outstanding cargo space. With the rear seats folded, the three-row Tiguan gets just 65.7 cubic feet of cargo space, which is near the back of the pack. But if you have a 4Motion model and don’t opt for the third row, that max cargo capacity figure will grow to 73.5, which is among the best in the compact SUV set. The 2018 Tiguan features an easy-to-use and straightforward touchscreen infotainment system. Icons are large, and the system includes a Menu button that acts as a Home key. You can swipe through various menus with ease, and the vivid graphics are easy to read. The side buttons are a bit close to the screen itself, which resulted in my accidentally touching the screen on a number of occasions, but it seems like something drivers will get used to. A sensor can detect your hand as you raise it to the infotainment screen. Certain menu toggles along the bottom of the screen are hidden or minimized until you begin to raise your hand to the dash. When it senses your hand, these items pop up again. Volkswagen also offers Apple CarPlay and Android Auto, which integrate seamlessly with VW’s infotainment system. The SE trim, like our test model, does not come with navigation, so using Apple Maps app was a must. You can type in the address on your smartphone, and it automatically loads the directions onto the touchscreen. 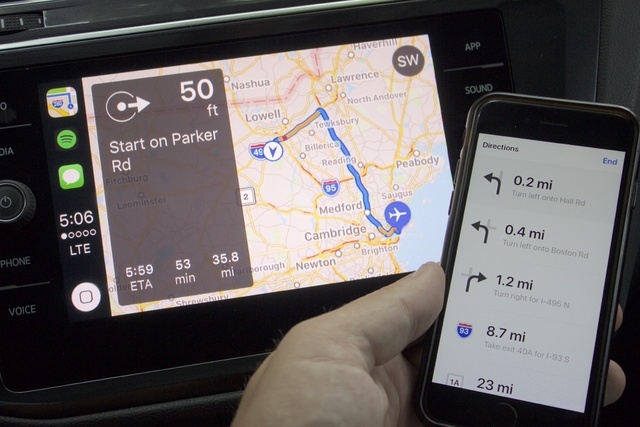 It will also audibly read out directions, even if you are in the VW infotainment screen rather than the CarPlay screen. CarPlay also lets you seamlessly play podcasts or music from apps like Spotify. Finally, the SEL Premium also comes with the Volkswagen Digital Cockpit. This system replaces the entire instrument panel with a digital screen. You can customize the screen to present different menus and even project the navigation system’s map on most of the instrument panel. 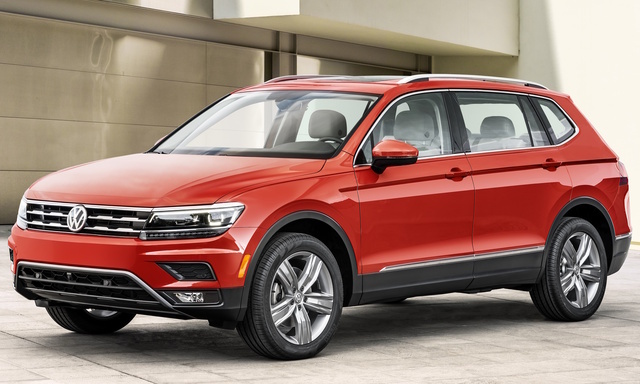 The Tiguan comes standard with dual front- and side-impact airbags, side-curtain airbags, a tire pressure monitoring system, electronic stability control, and a reversing camera. Forward-collision warning with autonomous emergency braking and a blind-spot monitor with rear cross-traffic alert are optional on the base S trim, but standard on all other trims. The SEL comes with adaptive cruise control, while the SEL Premium adds a 360-degree camera, active blind-spot monitor, lane-departure warning system, automatic high beams, and park distance control. The latter feature is available as an option on the SEL. The 2018 Volkswagen Tiguan has a base MSRP of $25,345 for the S trim. The SE trim starts at $29,080, and an SEL starts at $32,550. The range-topping SEL Premium starts at $36,250. Our test model was an SE 4Motion, which started at $30,380. The only option was the absolutely massive panoramic sunroof—a $1,200 option. This sunroof features subtle but very attractive LED accent lighting. Volkswagen has pivoted the Tiguan away from its sporty, fun-to-drive predecessor to take a run at the mass market of compact SUVs. In the process, the things that used to make the Tiguan unique are lost. Instead, it’s a vehicle for the masses, and that’s the way VW wants it. If you want a sporty compact SUV, the Ford Escape offers one of the most powerful engines in the segment. But for our money, the Mazda CX-5 is the upscale, fun-to-drive crossover that the Tiguan once was. But for the average crossover buyer, the Tiguan has the space and features to be an excellent choice for daily driving and weekend trips. Just don’t expect it to have the performance of its predecessor. What's your take on the 2018 Volkswagen Tiguan? Airhead2006 This car definitely has my interest. We owned 3 VW TDI's...a Jetta, Jetta Sportwagen, and Golf Sportwagen. They were all excellent cars and the new Tiguan looks like it has the extra space we're now looking for. I've always liked VW interiors and this one does not disappoint. To be honest, one of the biggest things that piqued my interest on this car is the 6 year 72,000 mile Bumper to Bumper warranty! I'm surprised this wasn't mentioned in the review because I would imagine that to be a huge selling point for many. GuruD5N5D Absolutely right on the warranty, the lack of power is disappointing though. Might be hard to overcome, and sticking to sport mode doesn't seem like a good long term solution. mayberry156 Everything, but the engine available sounds good. I like the part of a 6 yrs 72,000 mile Warranty!! AC I'm interested in a loaded SEL Premium FWD and test drove one today. Both of my children have had a Tiguan (2014 & 2011), and I've wanted one for several years. Only hesitation is the size, it's big for me (senior lady) and previous edition was my ideal size. The new Tiguan isn't as curvy & attractive as the earlier edition, it's more boxy, but such is life. 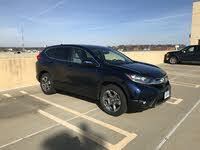 Today I thought it handled well, engine did not seem sluggish but I only drove it 9-10 miles in the test. I asked for specific driving tests; we did half a dozen stop-to-quick start and a few U-turns, and I asked for a couple of exits on the freeway so I could open it up. All in all I liked it, was impressed by a much quieter cabin than my current Subaru, and I like the newer dash & arrangement of controls plus great safety features. I don't drive much, maybe 5-6 thousand miles yearly, and the car itself & warranty are appealing. I don't need high performance but good visibility, comfort, and safety are important to me. Note: one demerit for the 3 back seat headrests which completely block the rear window, so they will have to come off if I buy. Regrettable but I live & drive alone, haven't had anyone in my back seat in about 5 years. Nice car, not as much fun to drive as the 2 models I drove last week (Audi Q3 & Mercedes GLA 250) but I'm trying to be realistic. At my age, simply put--what's important is what's important. Have you driven a 2018 Volkswagen Tiguan? Enter your zip to see incentives for a new Tiguan in your area. Does the United States add metals to their gasoline? If so which gas doesn't have any metals?